Cakey, pillowy-soft pumpkin cookies, loaded with spice, are sandwiched with fluffy Nutella Buttercream frosting! 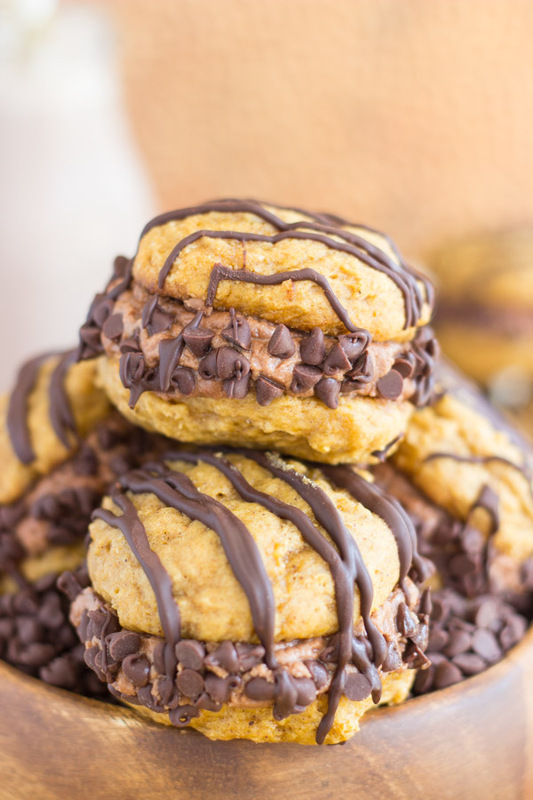 I’m not afraid to claim that these Pumpkin Nutella Whoopie Pies are one of the best pumpkin desserts and fall recipes EVER. 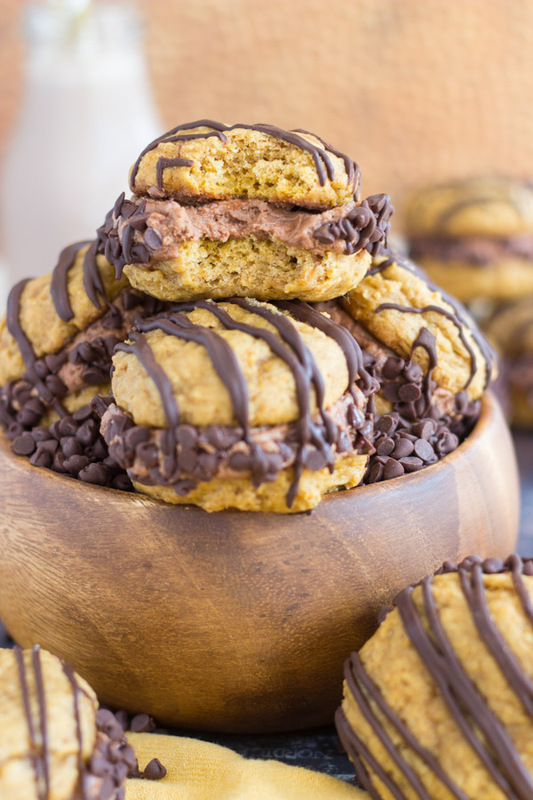 You’ve got to try pumpkin and Nutella together, and start with these Pumpkin Nutella Whoopie Pies! Let me start with a story. We came home famished from a day of playing volleyball at the beach, and my S.O. 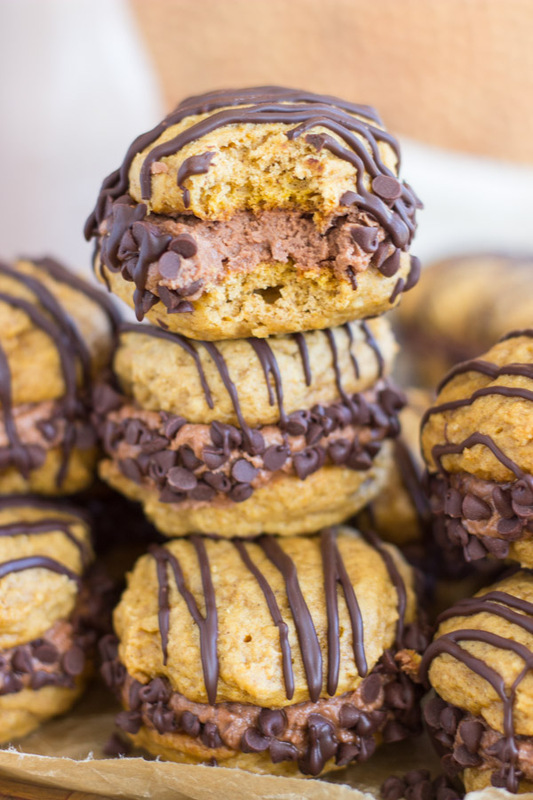 reached for the first thing in sight on the counter: these Pumpkin Nutella Whoopie Pies. Btw, I hate the term ‘whoopie pies‘, but that’s what these are, so I guess that’s what we must call them. There were 2.5 of these Pumpkin Nutella Whoopie Pies left, and I told him to “save me a little.” To be fair, I’d eaten far more of the batch than he had, but still, I did ask him to save me some. I swear, less than a minute goes by, and I turn my head to look over, and he’s shoveling the last bite into his mouth. Noooooooooo. I think you partly have to understand how hungry/hangry I was, but these were also so darn good, I really hated to see them go. He claimed he didn’t hear me ask him to save some. Sure, sure. He asked, “Aren’t there more?? ?,” and was pretty shocked to find out that was the last of them. 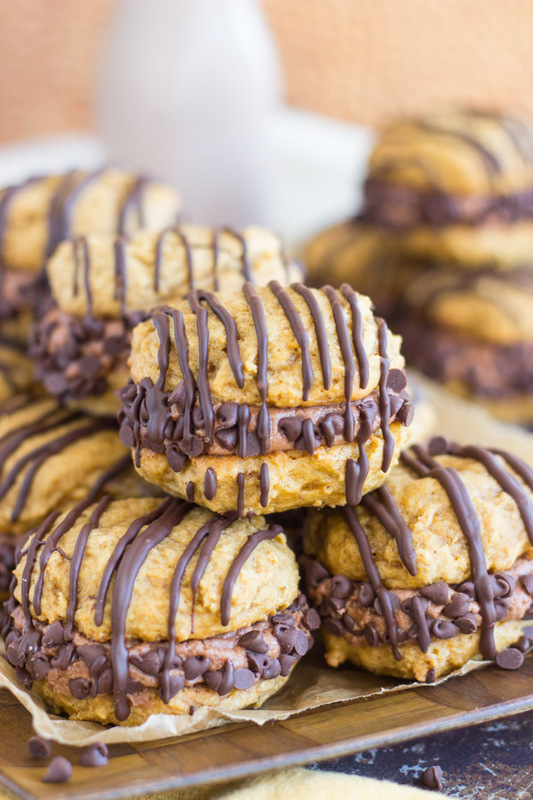 I’d made a big batch, and these Pumpkin Nutella Whoopie Pies are not little cookies. They are substantial and filling. He must’ve thought it was impossible that they were already gone. No, there aren’t more. I ate them all. It was actually me. I blew through nearly 2 dozen of these in about a week. There’s 4,000 other desserts stashed away in the freezer, but I still might make these again. The cookies themselves are wonderful on their own. 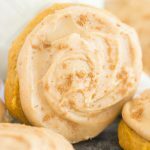 I’ve made these pumpkin cookies for years, and usually top them with a brown butter icing or lemon glaze. 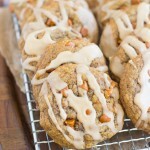 You can find the recipe in this post: Pumpkin Cookies with Brown Butter Icing. There ya go! They make for perfect whoopie pies though because they’re soft and cakey, but sturdy enough to hold a lot of frosting. They’re full of pumpkin and spice, and are pillowy soft. The perfect cakey pumpkin cookie, if you’re into that sort of thing. 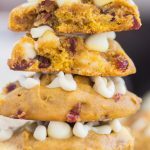 If you’re into chewy pumpkin cookies though, I’ve got you covered there too – these Pumpkin Spice Latte Cookies are so chewy and wonderful, with coffee glaze and TONS of spice. 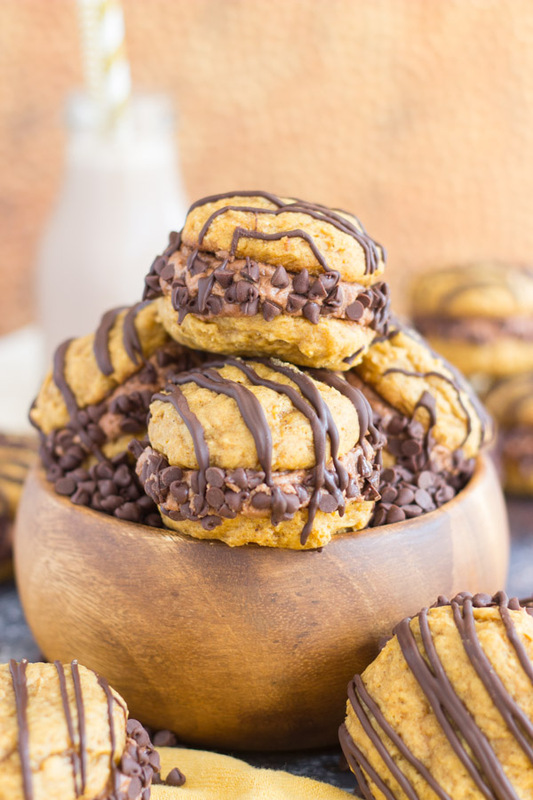 Fill two of these pumpkin cookies with fluffy Nutella Buttercream, dunk the edges in mini chocolate chips, and these are straight from heaven. The chocolate and hazelnut buttercream with the spicy pumpkin cookie make for a very special match. One thing I would point out about these Pumpkin Nutella Whoopie Pies though: without the Nutella drizzle on top, they aren’t that pretty. The pumpkin and buttercream almost clash in appearance. Most people might not care, but I do like to make my food look pretty, if I can. The drizzle makes all the difference in the looks department. And it’s more Nutella, so it only helps. And if it turns out that you like pumpkin and Nutella together (you will! 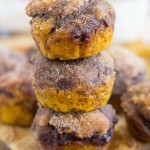 ), then check out these Snickerdoodle Pumpkin Nutella Muffins. They are a breeze to whip up – a batch is ready from the oven in 30 minutes from beginning to end. You will not be disappointed! 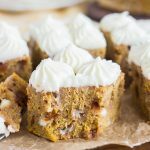 Cakey, pillowy-soft pumpkin cookies, loaded with spice, are sandwiched with fluffy Nutella buttercream frosting! 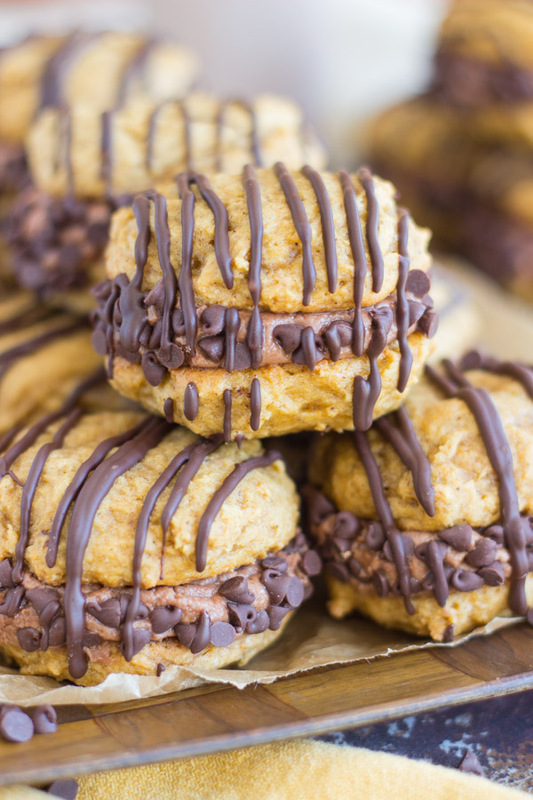 I'm not afraid to claim that these Pumpkin Nutella Whoopie Pies are one of the best pumpkin desserts and fall recipes EVER. You've got to try pumpkin and Nutella together, and start with these Pumpkin Nutella Whoopie Pies! In a large mixing bowl, cream together the butter and sugars. Add pumpkin, egg, and vanilla, beating until combined. In a medium bowl, whisk together flour, baking powder, baking soda, cinnamon, pumpkin pie spice, nutmeg, and clove. Drop by tablespoonfuls, and flatten slightly. Dough is sticky, so I used a small spatula lightly sprayed with non-stick spray to flatten. Bake at 350 degrees for 12-14 minutes, or until edges are lightly browned. Add powdered sugar, vanilla, and Nutella, beating until light and fluffy, 2-3 minutes. Pipe or spread the frosting between two cookies, forming a sandwich. Place the mini chocolate chips in a small bowl. 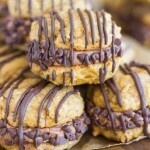 Roll the exposed frosting edges into the chocolate chips, pressing lightly to help them adhere. Repeat with remaining whoopie pies. 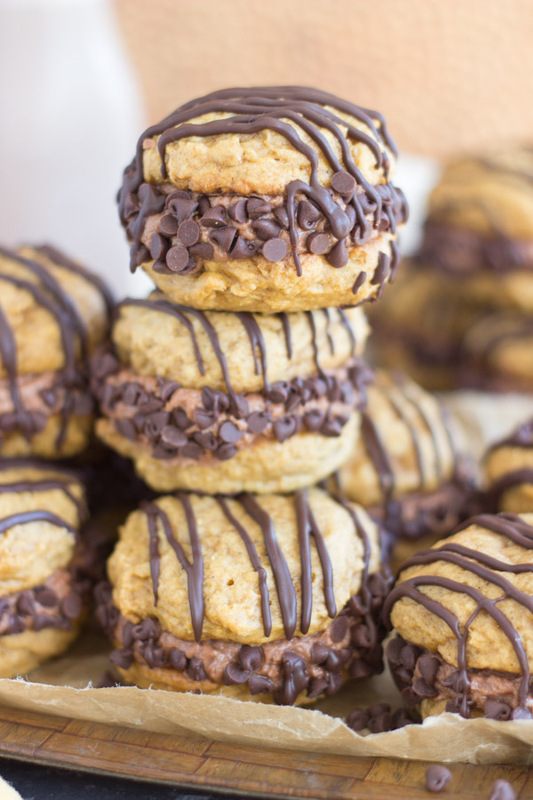 Drizzle whoopie pies with Nutella, and allow to set. Enjoy! Oh, man! I can guarantee that we would blow through that entire batch even faster than you. They sound INCREDIBLE! Whoa these look awesome, no wonder you guys couldn’t keep away from them! Love the pumpkin/nutella combination… I would not be able to resist!